Trying to write a really basic program in Python for compiling to exe. Basically, when the script is compiled to a 32-bit exe, it does't render properly (see left, right is the correct one). But when compiled to a 64-bit exe, the resulting program renders perfectly. 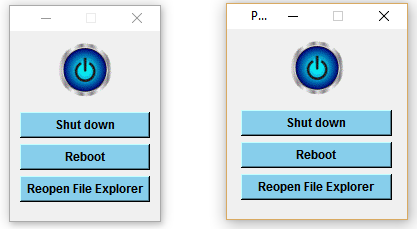 Both compiled using py2exe in python 3.4 and python 3.4-64 respectively. Code is at bottom of thread. Seemingly the 32-bit exe is ignoring the app.geometry command? I've tried other compilers such as cx_Freeze, none of them spit out a functional exe. Last edited by spleenharvester; 14-07-16, 17:35. Nevermind, finally got cx_Freeze to work, the exe produced by that is working fine. You may run into all sorts of weird edge cases with different Python compilers since they'll all have subtly different compatibility. If you need a portable EXE produced, then Python might not be the best language to code in.